CinLor Tech specializes in "All in One PCs" and "Small Form Factor" computers for consumers and the business industry. Energy Efficient - Shuttle's motherboards are designed to accommodate today's Intel and AMD processors that are low wattage to save energy. Quiet running - The SilentX Power Supply design is lighter than previous models yet increased the peak wattage to 500W in order to accommodate today's more demanding components. At the same time, they integrated two near-silent 40 mm fans into the power supply, one at each end to create a sort of pull-push airflow. Additionally, air vent design is newly optimized to prevent noise from air turbulence. The end result is a high-performance fan that outputs a mere 32 dB under a full system load. The power supplies also carry the 80 Plus certification to save 33% more energy. 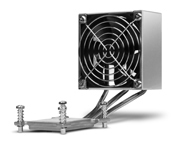 Oasis Cooling Technology - Specially designed 3-part heat-sinks interconnected by convection cooling pipes covering the North Bridge, South Bridge and MOSFET modules effectively dissipate heat without the use for fans. Featuring all-new heat pipe designs, Shuttle OASIS allows users to enjoy longer component lifetime through lower temperatures and added system stability all in a silent operational environment. 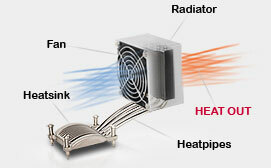 Integrated Cooling Engine 2 (ICE 2) - Uses convection cooling to dissipate heat away from and around the CPU. With all the same basic concept and designs the new improved version ICE 2 includes, copper tubes coated in nickel enhances tube hardness and rust-proof protection are filled with distilled water, effectively channels heat away, providing high efficiency processor and chassis cooling. I.C.Evo (Integrated Cooling Evolution) - Combining new technology - Vapor Chamber base with Heat Pipe Technology, boosts thermal efficiency by using vapor chamber, the flat and thin heat pipe to help spread heat flow equally than previous copper spreader. The new I.C.Evo lowers CPU temperatures by up to 7° C and provides best efficiency in cooling. Small, yet powerful solutions that can be used for Business Workstations, Home Office Servers and Home Entertainment, such as Gaming and HTPC. Cables and wires are already connected to the motherboard and wrapped for a clean build and improved air flow. For additional information regarding Shuttle computers visit our Blog. Create a Hackintosh with a Shuttle SFF , visit our blog for complete instructions.